Is there a need to have these spaces close to entrances anyway? These are the busiest areas. People are doing drop off’s /pick ups, more people are pushing trolleys and delivery trucks are coming and going. While disabled spaces need to be close to entrances, I am not so sure the same can be said about family spaces. For families the main benefit of these car parking spaces isn’t there location. Instead it is that the wider space allows car doors to be fully opened. This makes it easier to put children and babies in their car seats. 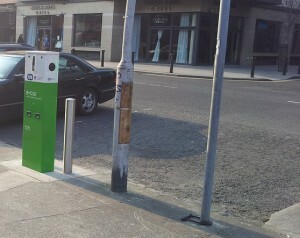 It would seem sensible to locate these away from busy entrances, and instead put them in quieter parts of the car park. Once, of course, there is a safe walk way to the entrance. The children might even get some fresh air and exercise. It would quickly solve the problem of people without small children, taking these spaces, as they would no longer be close to the entrance. Blocking footpaths. Virtually everyone, I am sure, would agree that to illegally park in a disabled car space is selfish and ignorant behaviour. However many people will park on the footpath and think nothing of it. But this also hinders wheelchair users and people pushing buggies and prams. Its not that safe for a wheelchair user to leave the footpath to go around a car and then try and get back onto the footpath. A walker meanwhile can squeeze through small gaps without slowing. This only occurred to me when I was a student renting and a wheelchair user knocked on my door to see if I knew who owned a car blocking him from using the footpath outside. I didn’t. Electric Car Spaces. A new problem is misusing electric recharging parking spaces. These are being unveiled in public transport hubs and town centres at present. They are a great idea. 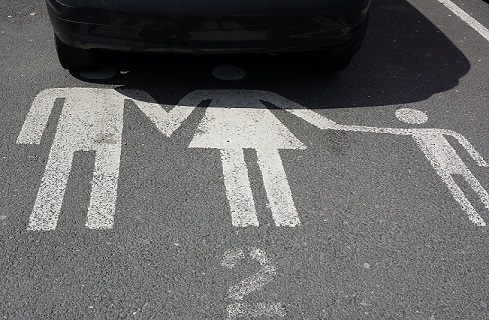 If you own an electric car, these spaces allow you to top up your car battery while you work or shop. Unfortunately the reality is that many of these spaces are being used by parked non-electric vehicles. This must be frustrating for electric car users. Especially if the next recharge point is out of range. Solutions. As with the family space issue above, perhaps the answer to people parking in electric car recharge spaces is to locate them in slightly less congested areas, where there is less temptation to park in them. This along with better enforcement might go a long way to solving these types of problems.